Often I would hear at the Family Foot and Leg Center here in Naples, FL, "Doc I have a bunion, or pain on the top of my foot around the big toe." 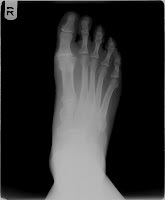 Technically the arthritis in the big toe can be called a dorsal (top) bunion. 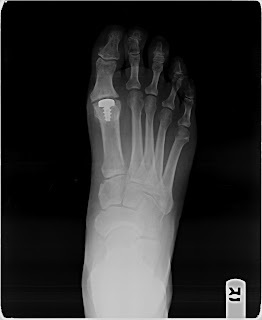 As you can see from the xray to the side here there is a bump on top of the big toe joint. There is also a lack of joint space in the big toe joint. 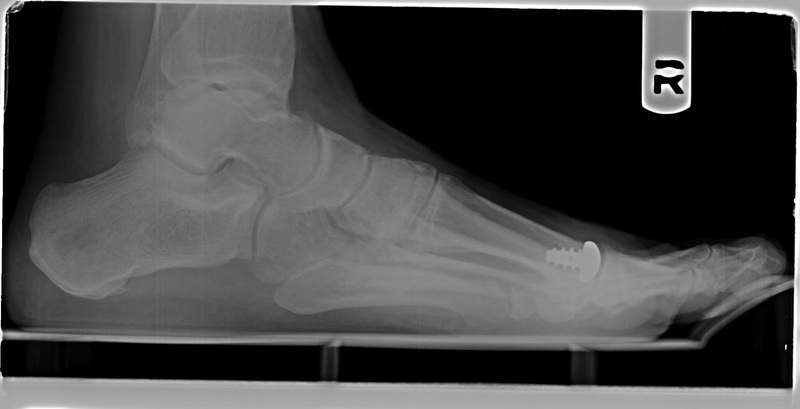 To the left here you'll see some spurring in the big toe joint. The space is also narrowed. Comparatively, look at the space between the 2nd metatarsal (long bone) and it's associated toe bone, there is a nice black gap in between, that gap is cartilage that is radiolucent (does not show on xray). The condition is called, Hallux Limitus or Ridigus depending on the stage of the condition. Causes range from: Post traumatic injury from soccer / football kickers, previous untreated big toe fracture, turf toe that caused joint injury, crush injury, poor choice of shoes or poor mechanics. Your podiatrist will be able to tell you more about your cause. Symptoms include: burning in the big toe joint, swelling, stiffness, deep throbbing pain, pain with change of weather, pain with bending the big toe joint. Now one thing can be confused for hallux limitus is gouty arthritis, with gout youur joint will be red, hot and swollen and painful to even a bedsheet's pressure. 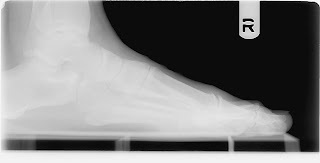 Hallux Limitus / Ridigus is more constant and consistent throbbing. There are stages of Hallux Limitus, the case presented here is a Grade III where it is almost self fused. Non surgical option will consist of using orthotics with a morton's extension, either rigid or made from cork. Surgical options depend on the stage of the disease: injections, joint fusion, joint replacement. The above real life case of Dr. Kevin Lam, the patient 5 years after a joint replacement with the arthrosurface implant. Patient remains pain free. Not everyone is a candidate for this implant. My personal criteria is 50 and over, good bone stock and people of mild to moderate foot activity. If you are a 5 mile a day runner, you do not qualify. Or if you are 30 years old, you do not qualify, etc. Some doctors have stretched these rules. 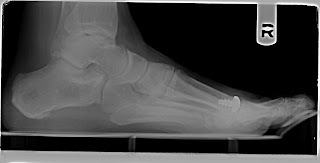 Implants can be metal, silicone or a combination of such. When you choose an implant make sure you realize that they may need to be replaced in 10 or 15 years, etc. Another surgery may be needed. 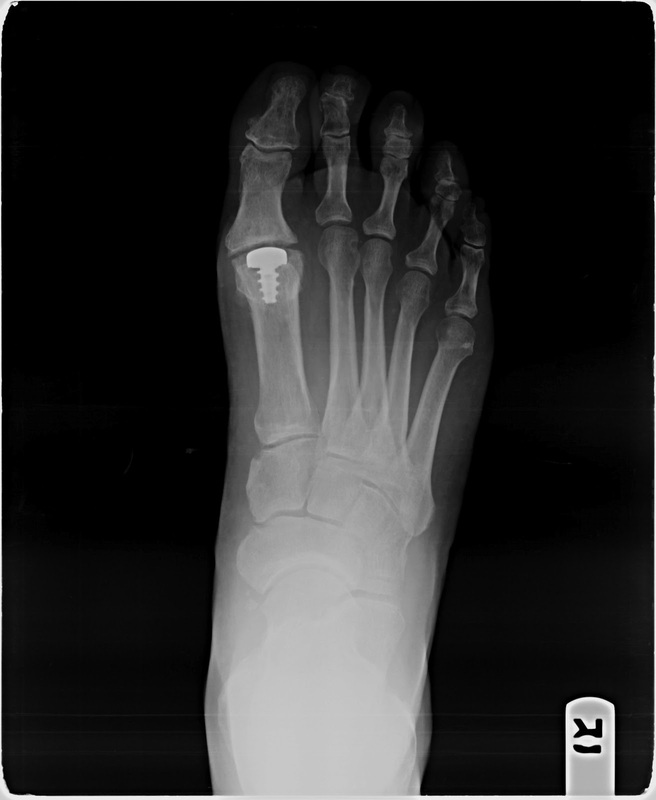 Fusion of the big toe has the best long term patient satisfaction according to new studies. Our center offers that too but also gives our patient choices. Fusion is great choice for active patients with debilitating pain. The end all procedure. The decision should be between you and your doctor, get some opinions. Beware of those that will tell you, I only fuse, or I only implant. There are choices and your doctor should be able to give you those choices and have the experience to guide you in the right direction. Patient many years post arthrosurface implant, very happy about such, made a video about it and here it is. Newest video with a full review and explanation about Hallux Limitus and Rigidus. Thanks for the information. It is nice to know that there are many options for arthritis in the big toe. Numerous options. I am very excited about this implant and results thus far. Im impressed, I have to say.I cant wait to make something like it. It’s very informative post about arthritis and I think that every person should know about this information. Thank you. Thank you for your kinds words and reading my blogs. great information for people suffering big toe joint pain!! Pierre Garcon's Toe Joint Injury.